When we first blasted our way into space a generation ago, we did so with men from each of the superpowers. Women were excluded from one of the most exciting adventures of the century-and not because they weren't up to the challenge. In 1962, three accomplished female pilots took their case before the U.S. Congress, but they were dismissed as unpatriotic. We were in a Cold War-a space race-and NASA had already chosen the Mercury Seven to represent America. 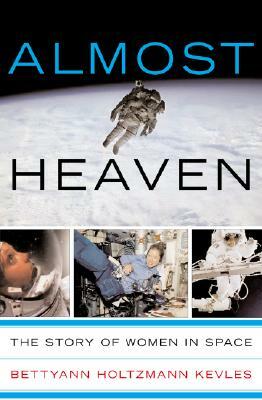 In "Almost Heaven," acclaimed writer Bettyann Kevles gives voice to the women of the space age-women who had the "right stuff," but had to struggle to prove it. Through intensive interviews and meticulous research, Kevles illuminates what makes these women tick. What were their unique concerns as female astronauts? Were they truly accepted into the astronaut corps, or were they merely "tokens"? She also poses a question that will affect generations to come: Is NASA preparing women as well as men for travel beyond Earth's orbit, or is the research still biased toward men?The stories of these forty women, told here for the first time in rich and colorful detail, explore the convergence of culture and science-and suggest the battle is far from over.